Does the pool fence at your new home comply with the current pool safety laws? Do you want to reduce the risk of a child gaining access to your pool? Do you want peace of mind? Let us complete your Pool Safety Inspection to comply with the law. If the inspected pool is deemed to be Compliant you will be issued with a Pool Safety Certificate – Form 23 within 2 business days and your pool will be placed on the Pool Safety Register. Access the register here. If the inspected pool is deemed to be Non-Compliant you will be issued with a Pool Safety Nonconformity Notice – Form 26. You will also be given an Inspection Report which will detail items (including photographic evidence) that have been determined to breach the current Pool Safety Standard and will require rectification within 90 days of the date on your Form 26. We also offer advice and recommendations on the non-compliant issues and can complete minor pool safety repairs if required. The Pool will also be registered as being Non-Compliant and under the Legislation must engage the re-inspection to be completed by the initial Licensed Inspector (us) to receive your Pool Safety Certificate. 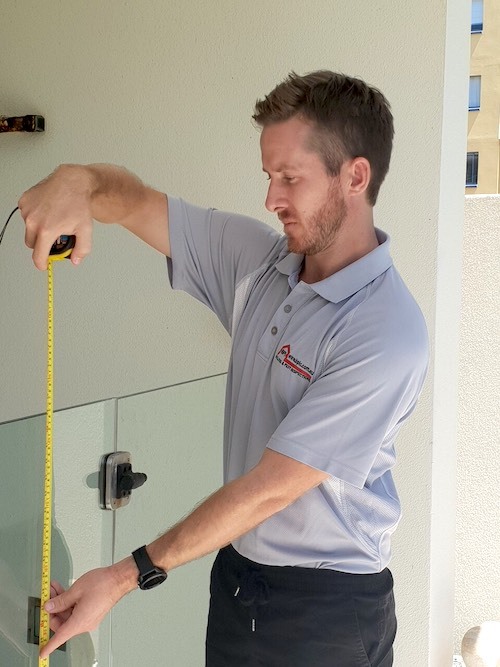 When all items have been rectified you can book a re-inspection through our office, and you will receive your Pool Safety Certificate within 2 business days of the successful re-inspection. Pool Fences – The pool fence must be 1.2metres high with a non-climable zone of 900mm within the fence. Gaps within the fence must not be greater than 100mm. Dividing Fences – Boundary fences into pool areas must be 1.8m high and must not have climbable rails or objects on your side (the pool side) of the fence. Alternatively the boundary fence can be 1.2m high with a non-climable zone of 1.2 m on the neighbour’s side. Climable Objects – remove climable objects (any object, toehold or ledge greater than 10mm) from the pool fence and surrounding areas and shield or remove climbable objects within 900mm of the pool fence. Climable objects within 300mm of the inside of the pool fence must also be removed or shielded.